In the last couple of weeks, there have been commemorations and celebrations of the life and work of Ella Fitzgerald, one hundred years after her birth. Among her celebrated performances are a set of television advertisements that both highlight Fitzgerald’s clarity of tone as a singer, and trumpet technological advances in audio and video recording. The two of them cannot exist without the other, and the phrase that accompanied them – “Is It Live, or Is It Memorex?” - became bigger than the company whose products it sold. The original ad, from 1972, features Ella Fitzgerald, performing live, breaking a crystal wine glass with her voice. This is followed by a hi-fi speaker playing a recording of the same performance, which breaks another glass. Two years later, another ad features Fitzgerald’s orchestrator, Nelson Riddle, listening to a live performance, then a recording of the same performance, and not being able to hear the difference. 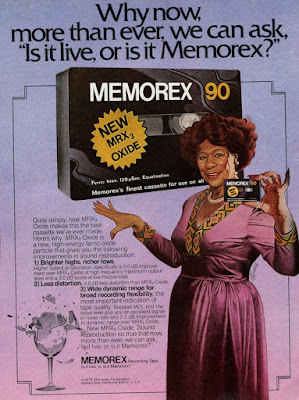 Fitzgerald also appeared in ads singing about the tapes themselves, and her music were still being featured in Memorex ads twenty years later, by which point the slogan, plus a picture of a breaking glass, appeared on all their packaging. One of the first tech company start-ups in Silicon Valley, Memorex already came from experience working with showbusiness. Its original employees, led by founder Laurence L. Spitters, originally worked for Ampex, which developed reel-to-reel tape recorders at the behest of Bing Crosby, who saw very early how the original German technology could be in recording his radio shows. Later, it developed a magnetic film sound process with producer Mike Todd, and experimented on overdubbing sound with Les Paul, he of the Gibson Les Paul guitar. 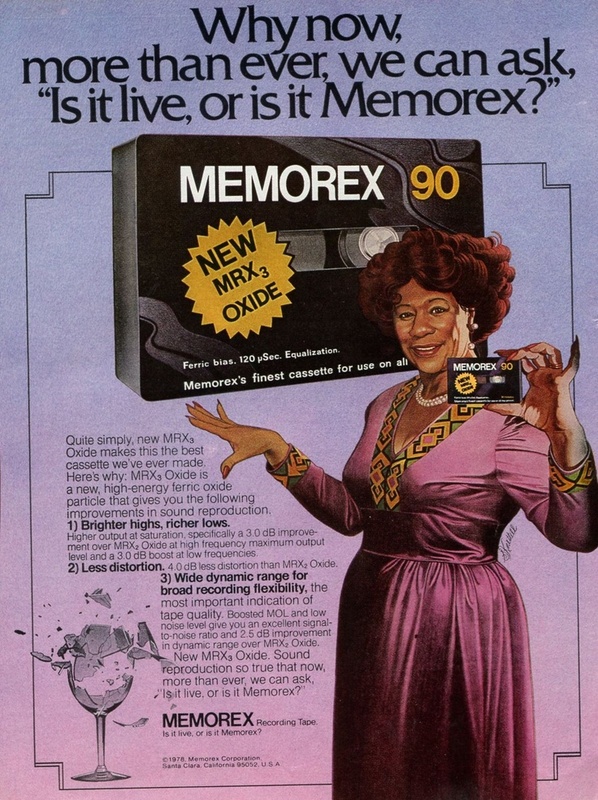 The reason Ella Fitzgerald’s Memorex ads stick in the mind so well is how they play with your idea of how the science works. You imagine that it must be the clarity of Fitzgerald’s singing that broke the glass, meaning you can break another glass using a recording of her voice. However, every glass has its own frequency at which it resonates, dictated by the type of glass used, the process in which it was made, any imperfections on the glass, and so on. The recording could break another glass, provided it had exactly the same resonance. Thankfully for Memorex, this means they cannot be sued by that one person that just so happened to have windows that had exactly the same resonance as the Steely Dan track they recorded onto one of their tapes. 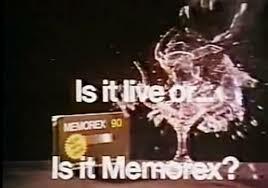 Admittedly, the reason for this nostalgia over Memorex was firstly being reminded of the ad, then finding out that the company is still going. It had been the first company to make data storage devices that were compatible with IBM mainframe computers, and the consumer electronics arm was a sideline. 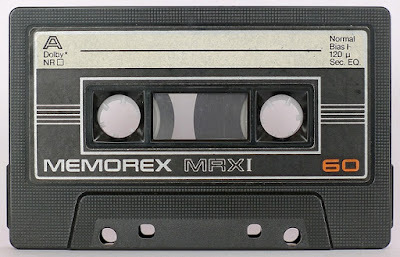 However, after not keeping pace at this end, Memorex was bought, the consumer business was sold off, and the brand name changed hands a number of times, before now joining other names, like Polaroid and Blaupunkt, in being found on a number of Bluetooth speakers and “boomboxes,” another name I didn’t realise was still being used. I’m sure Ella Fitzgerald sounds great on all of them.